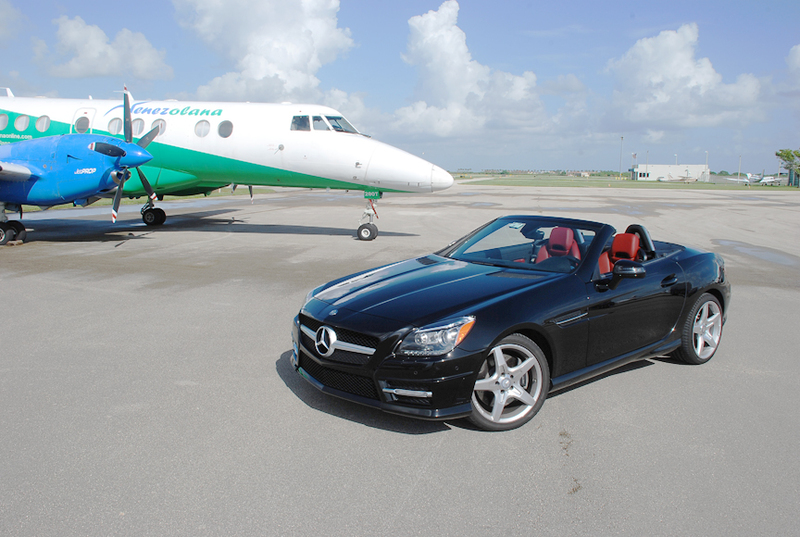 Of course, there is no doubt of the heritage of the 2012 SLK. There is a dramatic SLS inspired nose, as well as elegantly sculpted doors and rear deck, making the 2012 SLK the best looking version yet! The jewel-like adaptive headlights look perfect, so does the large Mercedes-Benz star, flanked by single, left and right air intake blades. Wheels are attractive, optional 18-inch AMG alloys, offering both an elegant yet aggressive look that fits the SLK nicely. The electrically operated folding hard-top, this time, with a smoked glass panorama roof is elegantly designed and flawlessly engineered. Trunk area is accessed through dual-hinged large hatch that offers a commodious trunk with the top up and as expected, a greatly reduced, but usable space when the top is stowed. Other hard top convertible vehicles seem to suffer from difficult to close trunk lids, yet the SLK offers a smooth, easy to close system. Once inside, you instantly notice the bright and airy cabin, thanks in part, to the panorama roof as well as the thoughtful design. Controls, switches, and other accoutrements are exactly as once again expected from Mercedes-Benz, that is to say, of great quality. Navigation inputs as well as infotainment items are intuitive to use, offering a rotary dial to access different menus and features. The sport- seats are supportive yet comfortable for long journeys, offering the ingenious “Airscarf” neck-level heating system, which blows warm air from the headrest towards the neck of the driver and passenger, making nippy, top-down driving days more comfortable. The thick leather-wrapped steering wheel offers finger-tip commands for typical items, such as music, phone, cruise-control and data display. One inviting interior feature is the optional direct ambient lighting, offering red accented thin strands of light throughout the cabin, giving the SLK interior a touch of drama and warmth. Starting the engine in an SLK is a delight, with its fast-whine starter and the throaty engine sound, the 302 HP 6 cylinder engine invigorates the senses. Gear selector is silky smooth, and once it’s in D you can let the fun begin. Throttle feedback is noticeably better than before, offering easy to modulate throttle as well as a progressive, yet perfectly balanced braking. 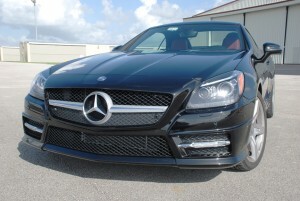 Exhaust sound is sporty yet not overly so, giving the SLK, the often lost balance of luxury and performance. Feel like driving a bit more aggressively? 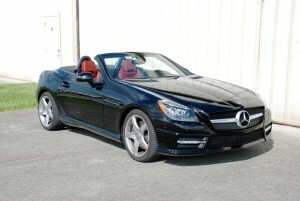 Not a problem, the SLK delivers exactly what is expected from a roadster, thus giving the driver an enhanced experience both on back country roads as well as on any interstate. The 6 cylinder motor is eager to please, offering a command performance every time you ask for it, yet able to deliver respectable fuel economy under mixed city/highway driving conditions. Years ago, my impression of some Mercedes-Benz models was one of vagueness, lack of road feel and dull driving dynamics. I’m happy to say that current generation M-B vehicles have completely changed from that. The current generation vehicles are responsive, dynamically connected to the road and whimsically interesting to drive, bravo Mercedes-Benz! The 2012 SLK, the 3rd time is definitely the charm! 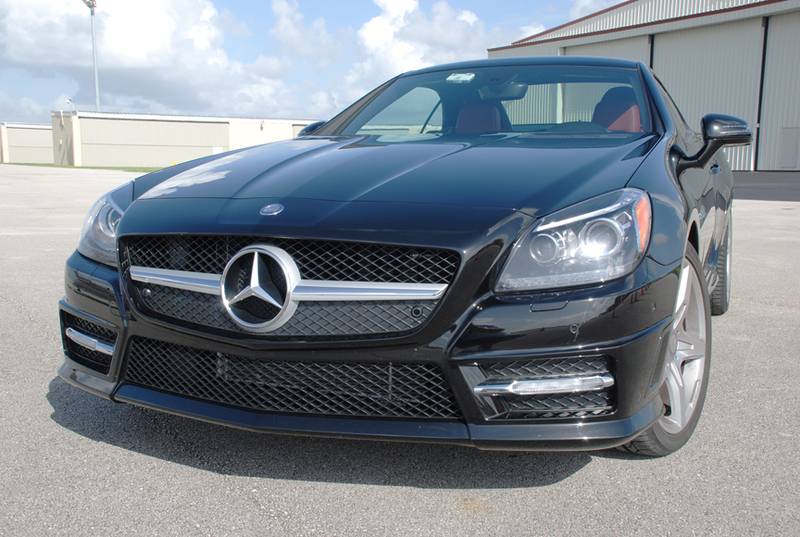 ← The perfect blend of sportiness, luxury, comfort and design.